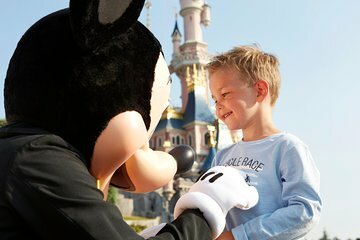 Het boeken van een shuttle transfer tussen het Disneyland® Resort Parijs en de stad Parijs of een van de internationale luchthavens van de stad neemt de stress weg bij het begin of het einde van uw reis. Klim in een comfortabele hybride auto of minivan, afhankelijk van de grootte van je groep, en vermijd taximeters en het gedoe van het openbaar vervoer. Wanneer u uw transfer boekt, dient u uw aankomst- en vertrekinformatie van uw vlucht of details van uw hotel in Parijs te delen. Hotels in het stadscentrum met postcodes tussen 75001-75020 vallen onder deze service. Uw boeking wordt onmiddellijk bevestigd, waarna u een reischeque ontvangt om aan uw chauffeur te overhandigen. Genoemde prijzen zijn per persoon, gebaseerd op acht volwassenen per auto. Let op: transfers zijn normaal gesproken dagelijks beschikbaar van 04:00 tot 23:00 uur, maar op 24 en 31 december zijn de beschikbare uren van 16:00 tot 18:00 uur. They never showed up and never answered their phone even during business hours. Maybe a scam? Their online ratings are horrible. We had to find a different ride. we were picked up at 9AM. Driver was on time but did not know how to get to Disneyland. It took him 85 minutes to find this place of course using our help. The worst happened on the return which they did not show up after making us wait for additional hour from original scheduled time of 3PM. I called them at least 5 times and was told driver is late due to traffics. They finally called me back at 4 and asked me to take metro since the station was nearby. Please think twice before booking for this service. Our transfer was great in terms of convenience however our pick up was late although traffic was nuts to the point we were starting to worry and our arrival driver did not speak English which was a barrier for us. The journey from our hotel to Disney was not that great. The driver was asking too many questions relating to our transport arrangement to the airport, kept pushing to sell his company's service. When we told him we have already booked the transfer, he asked which company did we book from. He driving skill was not very desirable. And he gave us the wrong information on the pick up location back to the city from Disney. In the end we waited 30 minutes and realised we were waiting at the wrong place. I have to say the journey back from Disney was a lot more comfortable. The driver was skilled in his driving, focused, and polite. Well worth it less hassle . The driver was really good and funny!! Driver was not waiting with a sign as advertised and was 20 minutes late arriving. We had to find another Parishuttle greeter to call the office and find out where to meet the driver. When we finally connected with our driver he was very courteous and the trip was much quicker than advertised. Drivers were on time, knowledgeable and did not drive fast. I would recommend having a private transfer because it saved us time, drop off point was close to the entrance ,very convenient. Just great......you can never really go wrong with Disney.